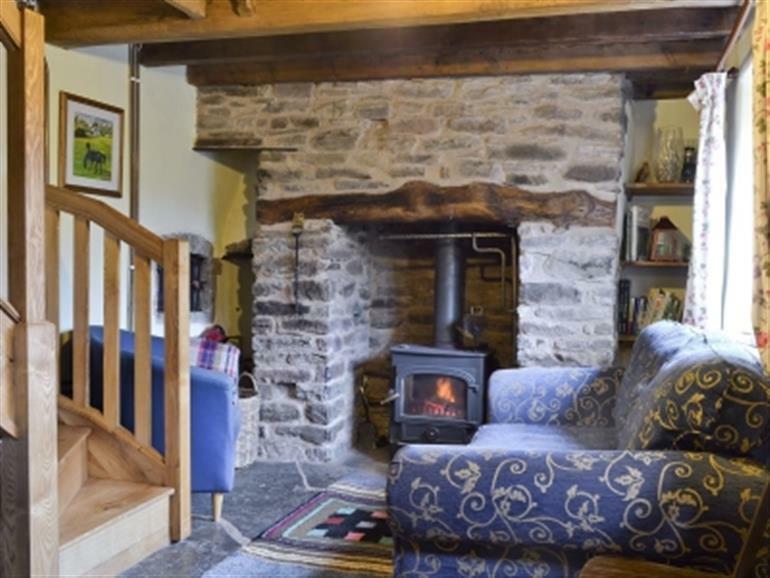 Buckshead Eco Cottage in Brynmawr, near Clun sleeps 4 people. Buckshead Eco Cottage offers the perfect place to relax, enjoy the breath-taking views and unwind or, for the more active, there is ample opportunity to explore the local countryside and wildlife, with many footpaths and cycle paths close by. Buckshead Eco Cottage is located within its own grounds on an organic hill farm in the Clun Valley, where electricity is generated by wind power and hot water provided by solar panels, and is the ideal holiday location to reduce your carbon footprint whilst taking in the landscape and experiencing organic hill farming. Carefully renovated to a very good standard, using local materials, both to retain its traditional characteristics but also to fully accommodate eco-friendly design principles. Wi-Fi is available in a separate unit on site. The Shropshire Hills are located adjacent to the Welsh border and the southern part of the region, in particular the Clun Valley, has outstanding beauty and peaceful character allowing unlimited opportunity for those that love nature, cycling and walking to enjoy the beautiful rolling landscape. Visitors can enjoy the quietness of the Long Mynd, the secret beauty of Caer Caradoc and the Stiperstones, or follow Offa’s Dyke Path, which runs just outside the local village. Other local attractions include Clun Castle and the Secret Hills Discovery Centre at Craven Arms. Further afield, day trips can be made to Snowdonia, Brecon Beacons, Elan Valley reservoir, various Welsh coastal resorts, historic Ludlow, Hereford, Shrewsbury and Bishops Castle. From the door enjoy breath-taking views and wonderful landscapes. 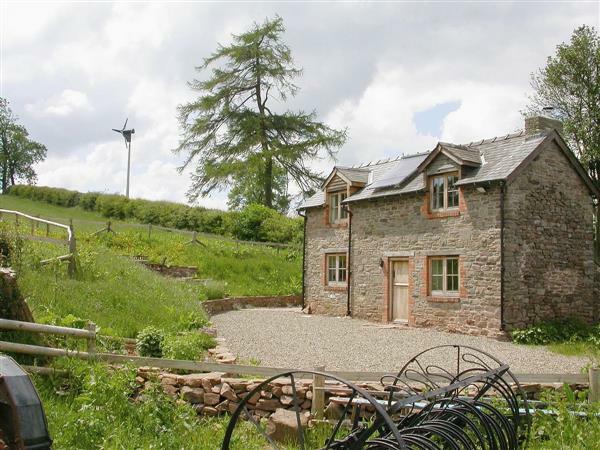 Brynmawr Farm, the holding where Buckshead Eco Cottage is located, includes the Shropshire Wildlife Trust Nature Reserve, a beautiful large expanse of upland moorland, designated as a SSSI. Explore the farm, which hosts a range of wildlife and includes ponds, meadows and a brook. There are a number of local country pubs that offer excellent pub food and traditional ales or, alternatively, why not visit local towns such as Bishops Castle or Ludlow for a range of places to eat out. The farm leading to the property is proud to support Care Farming West Midlands. The nearest shop is 7 miles, with the pub and restaurant being 3 miles from Buckshead Eco Cottage. Wood burner in living room included. Partial electricity and solid fuel central heating, bed linen and towels included. Travel cot and high chair on request. Freeview TV. Gas cooker. Microwave. Use of owner’s washing machine. Sitting-out area and furniture. Barbecue. Parking (3 cars). Natural water supply from spring. Pet free of charge. No smoking. Holidays at Buckshead Eco Cottage in Brynmawr run from Friday to Friday. Pets allowed at Buckshead Eco Cottage. For a better idea of where Buckshead Eco Cottage is, you can see Buckshead Eco Cottage on the map below. Buckshead Eco Cottage is in Shropshire; should you be on the lookout for a special offer, you can find all the special offers in Shropshire. It's always worth checking to see what is on offer at the moment. Do you want to holiday near Buckshead Eco Cottage (30591), you can see other cottages within 25 miles of Buckshead Eco Cottage; have a look to find your perfect holiday location.